PG&E wants more. Will legislators give it? Pacific Gas & Electric Co.’s chief executive on Thursday labeled as “insufficient” Gov. Jerry Brown’s proposal to ease utilities’ liability costs when their equipment sparks fires. Remind me: Brown offered the plan to deal with future fires, as legislators opened hearings this week to consider the complex law governing how to assess costs and liability associated with wildfires. 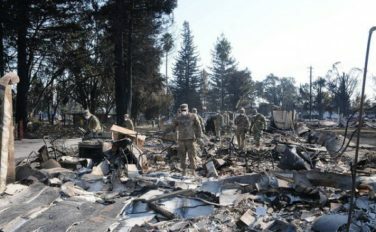 The governor’s proposal would shift future fire costs, to the insurance industry and homeowners, or maybe to the state. Insurance companies oppose it and some legislators are skeptical. The company also wants relief from costs from devastating Northern California fires in 2017 that killed 45 people. Williams praised one measure by Assemblyman Bill Quirk, a Hayward Democrat, that would allow the utility to spread out the cost over years. Bottom line: Williams’ comment didn’t help PG&E cause in Sacramento. Legislators don’t want the state’s largest utility to go bankrupt, something Williams has warned about. But in an election year, legislators will have a hard time approving legislation that smacks of a PG&E bailout. Before becoming a Silicon Valley initial public offering success on Wednesday, Sunnyvale-based Bloom Energy received hundreds of millions of dollars in subsidies that came from California electricity ratepayers. Remind me: Bloom gained prominence in 2010 when “60 Minutes” told the story of “Bloom Boxes,” fuel cells that use natural gas in chemical reactions to generate electricity. Google, Wal-Mart and many other customers buy the black cubes to limit their carbon footprint and get off the electricity grid. Backstory: Bloom, founded in 2001, benefited from venture capital funding but also from an obscure state program funded by electricity ratepayers called the Self-Generation Incentive Program—insiders call it SGIP. Between 2007 and 2016, Bloom received or will receive payments of $375.9 million, the Public Utilities Commission told me Thursday. The program was created by one obscure sentence in one piece of legislation approved in 2000. The company hasn’t received the subsidy since 2016. But it sponsored 2016 legislation allowing owners of its boxes to sell excess electricity back to the grid, as people who have rooftop solar arrays can do. Seattle has a lot in common with San Francisco: bustling economy, a major tech sector, a Democratic electorate, a strong environmental ethos, and soaring housing costs that make living in either city a prohibitively expensive proposition for many long-time residents. But Seattle has responded to its housing crisis much differently than its Bay Area counterpart. Seattle built more than twice as many homes as San Francisco between 2010 and 2016, the San Francisco Business Times reportednot long ago. Seattle rents are far more expensive than they were five years ago but have begun to stabilize. In the latest episode of their Gimme Shelter podcast, CALmatters’ Matt Levin and the LA Times’ Liam Dillon talk with Mike Rosenberg, housing reporter for the Seattle Times and the best follow onTwitter about housing. The three of them compare how the housing crisis is playing out differently in the Pacific Northwest than in California, and what lessons we can learn from our northern neighbor. Democratic congressional candidate Jessica Morse falsely claimed that Republican Congressman Tom McClintock had authored a mere three bills that were signed into law in his four terms in office, PolitiFact California concluded. Background: Morse, a first-time candidate, is running in what has been viewed as a safe Republican seat. She has attracted attention by raising more money than McClintock, who is seeking his fifth term. The PolitiFact fact-checker, working with Capital Public Radio, found that McClintock, who resides in Elk Grove, authored four bills that have been signed into law. Morse was, however, correct that two renamed post offices in the district, which is east of Sacramento and encompasses much of the Sierra. Politifact: Claims about members of Congress passing a small number of bills aren’t new. Nor is it necessarily a measure of effectiveness.